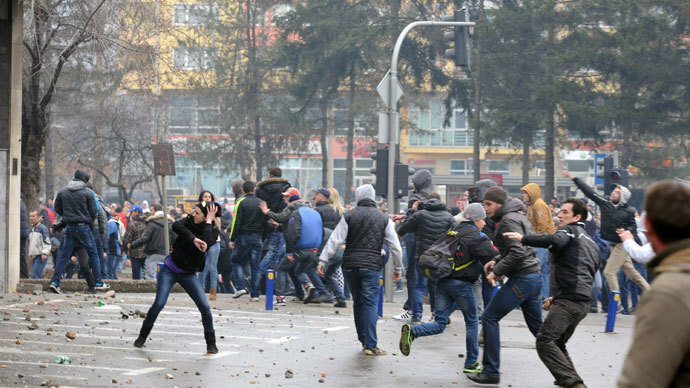 – Protest started on 4th of February in the industrial city of Tuzla. Workers of several privatized companies based in Tuzla organized a protest (without the help or support of trade-unions) demanding the cancellation of privatizations and against closing-down of the factories. They were joined by large number of people from the city and the region, especially students and unemployed youth. – In the next few days, solidarity protests were organized in several other cities in Bosnia and Herzegovina. This was not the first mobilization in Bosnia of this kind, but a continuation of earlier protests against poverty and corruption that are frequent in the last few years not just in Bosnia, but in many countries in the region (Bulgaria, Romania, Croatia, Slovenia etc.). Bosnia has the lowest average wage of all these countries and has significantly larger rates of youth unemployment than Greece, Spain or Croatia. – The protests that started last week were much more numerous than previous protests. Also, the protesters very successfully defended themselves against police repression. On 7th and 8th of February, the protesters managed to occupy and partly burn several local and state government buildings in Tuzla, Zenica, Bihac, Mostar and Sarajevo, including the building of Presidency in Sarajevo. They have also forced several regional governments to officially resign. (Due to the complicated ethnicity-based political system, regional governments have bigger powers than the state government). – On Sunday, 11th of February, coordinated by the EU, governments of Croatia and Serbia interfered. On the same day, government of Serbia met with ethnically Serb politicians from Bosnia and Herzegovina and Croatian prime-minister visited ethnically Croat politicians in the city of Mostar in Bosnia-Herzegovina. Since then, Croatian media and politicians have started an aggressive campaign claiming that the protest are not social protest at all but are oriented against the Croats in Bosnia and Herzegovina. The Serbian media and politicians have started a similar campaign claiming that the protests are the “beginning of a Muslim war against Serbs”. However, the protests have spread not just to ethnically mixed cities like Tuzla or Mostar but also to predominantly Croat towns like Livno and Orasje, and predominantly Serb towns like Prijedor and Bijeljina. Also, Turkish foreign minister Mehmet Davatoglu has visited Sarajevo, met with politicians and the Islamic Community and promised that Turkey will prevent a war “like one in the nineties”. – Unlike in Ukraine, the EU has condemned the protesters and not the Government. The highest level of power in Bosnia and Herzegovina in not the state of regional government, but the “Office of Hight Representative”, a kind of colonial governor appointed by the EU with support from the United States. Current “High Representative”, an Austrian called Valentin Inzko, has promised that the EU will intervene militarily if the protests continue. Several other EU and US official have called for a faster “NATO integration” in Bosnia to “ensure stability”. – During the past weekend, the protesters in several cities such as Tuzla, Sarajevo and Mostar have organized “plenums”, peoples’ assemblies that aim to substitute the falling political structures on regional level. The plenums have since been organized in dozens of cities and towns, big and small, all over Bosnia and Herzegovina. The demands of plenums are similar: resignation of governments, cancellation of privatizations, release of the arrested protesters etc. Contrary to propaganda in the western media, no plenum has demanded any involvement by the “international community”. – Hundreds of people in Bosnia and Herzegovina have been beaten and arrested by police in Bosnia and Herzegovina, many of them “preventively” and many for “supporting protests” on the internet. – Solidarity protests are being organized in Croatia and Serbia this week. The peoples’ rebellion in Bosnia and Herzegovina which is an anti-nationalist and social rebellion is being attacked by the reactionary alliance of the imperialist forces (EU, US), regional expansionists (Turkey, Croatia, Serbia) and local chauvinist political elites. The joint attempt of these forces to try to separate workers and peoples of Bosnia and Herzegovina along ethnic and sectarian lines to secure their own influence, proves once again that imperialism can not solve the national question in the Balkans. It in fact produces these divisions and tries to use them as a last line of defense of the system against the peoples’ rebellions. For this reason, it is of great importance to support the current struggle in Bosnia and Herzegovina, to combat misinformation and reactionary propaganda and to fight against foreign involvement of powers trying to suffocate the rebellion. Spread the word, build new barricades, strengthen the struggle!